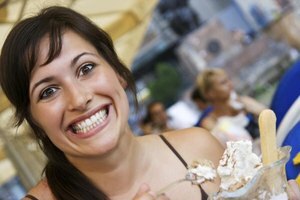 A woman forcing a smile in a restaurant. Although dealing with passive-aggressive behavior can drive you over the edge, these behaviors are often an effective way for the person to mask anger and hostility. According to psychologists at NYU Langone Medical Center, passive-aggressive people may appear to act or comply appropriately, but passively resist. Pinpointing these behaviors can be the first step in dealing with the person effectively and minimizing their control over you. Look for subtle negativity or aggression in the person's comments or statements. Passive-aggressive people have a tendency to use verbal hostility disguised in gossip, sarcasm, hostile jokes, teasing and criticism, says communications professor and author Preston Ni in his Psychology Today article "How to Recognize and Handle Passive-Aggressive Behavior." Determine if the person always seems to demean others or sabotage their ideas with indirect statements. Passive-aggressive people are so good at hiding hostility in their words that their statements seem innocent, but come loaded with animosity. Ask yourself if the person always acts like they are the victim or the unlucky one. According to the Diagnostic and Statistical Manual of Mental Disorder: DSM-IV, people with a passive-aggressive personality tend to complain about being misunderstood or unappreciated by others and exaggerate their misfortunes. A passive-aggressive person's resentment and hostility often stem from feeling like they always get the short end of the stick. People suffering from the victim syndrome often complain about everything, but take no accountability for their actions. Instead, they try to hurt others to get even for their misfortunes. If you feel like you're always walking on eggshells with a certain person, you're probably dealing with a passive-aggressive personality. Remember that this type of person always feels like their problems are not their responsibility and blame them on others. Other people's comments can easily offend them and they feel like they have to sabotage other people's good fortune. Although passive-aggressive people seem to be compliant and cooperative, sulky and argumentative behaviors are their way of resisting. Although they are not outwardly defiant, people with passive-aggressive behavior tend to trick others into thinking that they will comply or do as they are told. Temporary compliance in which the person agrees to a request and then puts off doing it is the most common form of passive-aggressive behavior, says author and licensed social worker Signe Whitson in her Psychology Today article "The Five Levels of Passive Aggressive Behavior." Another way they mask their defiance is by doing things inefficiently or in a way that will sabotage another person's expectations. INSEAD: Are you a Victim of the Victim Syndrome?